Boston’s second win in as many matches sees them top of their pool. The away side started the brighter and were on the offensive from the first kick of the game. Controlled possession saw Boston gain a penalty just inside the 22 after six minutes, which Tom Hobbs dispatched with confidence to put Boston up 3-0. In the 14th minute, Hobbs extended the lead with a fine try following a barnstorming run from Joby Ancell. More points arrived for Boston when Louis Williams scored two tries, Hobbs adding a conversion. Joe Langford had his reward for his efforts by scoring the final try of the first half following a cutting run, and again Hobbs converted. 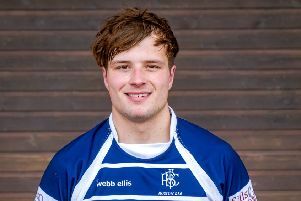 After the re-start, Hobbs intercepted the ball and fended off repeated attempts to tackle him before offloading to Emanuel Araujo to score in the corner. After Jordache Stones-Blackman was unlucky to be shown the yellow card, Moderns made the most of the extra man and scored two converted tries. The final minutes of the game were more like the first half. After making further changes and bringing experienced players back into the game, Boston scored their final try. Decisive play from the backs saw the ball moved out to Tom Baldam who scored in the corner. Callum Scuffham was the man of the match. BOSTON: Allen, Ancell, Araujo, Baker, Baldam, Clark, Colson, Cook, Curtis, Cuthbertson, Gray, Hardstaff, Hobbs, Langford, Moody, Raggo, Scott, Scuffham, Stones-Blackman, C. Taylor, T. Taylor, Williams.